You are here: Home / Consumer Products / Cerwin Vega, Inc.
Cerwin-Vega, Inc. is a designer, manufacturer and distributor of a variety of audio and visual equipment products, including speakers and amplifiers. Cerwin Vega's brand name is highly recognized within the audio visual equipment industry, due to the Company's 30 year history and reputation for creating innovative products. Based in Simi Valley, California, Cerwin-Vega products are distributed primarily through large mass merchandisers for household, automotive, and professional markets. Although a number of strategic buyers expressed interest, the Stanton Group emerged as the highest value offer. 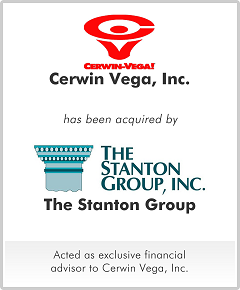 The Stanton Group indicated that it recognized significant value in the Cerwin Vega's brand name, complimentary products and established distribution channels.